I had these sneakers for nearly 15 years. I was in love with them despite the urges from those around me who did all but beg me to get rid of them with promises that a new pair would offer me all that these had and more. Nope! This was true love. These sneakers made me happy. 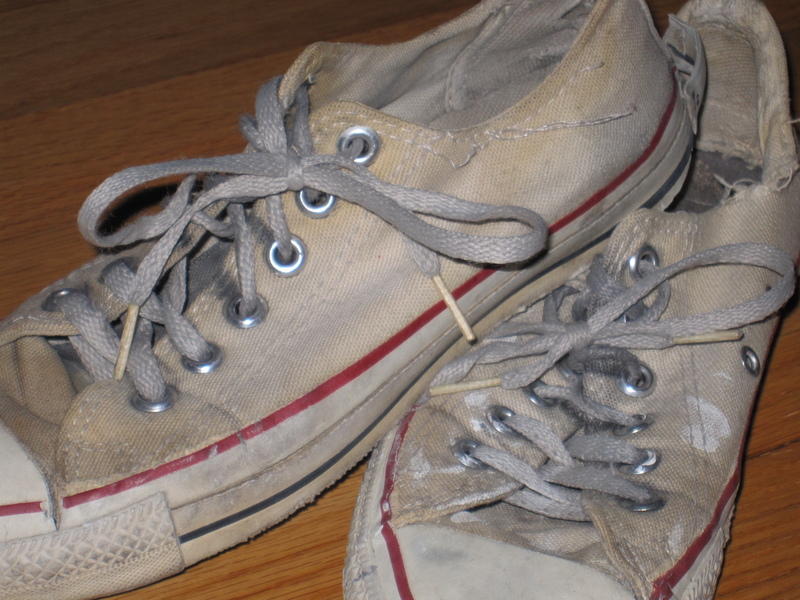 For me, the dirtier and more worn the better. They had holes in them and the soles were falling off and that gave them character. I was relentless. I tried to make them work in more than a million ways. Occasionally there would be a sign that they were unwearable, for example I was extra careful about putting them on so not to rip them further and never dared to tie the delicate laces too tightly. I was seriously committed to my denial. The time finally came when it became irrefutably clear that these sneakers were no longer working for me. They had supported me (literally) through many times in my life, many changes and challenges that I had faced, and if they had a soul, they would have thousands of stories to tell. It was difficult to part with them (and truth be told, I held onto them for months even after I got a new pair) but I had to accept that they no longer worked for me and were actually hurting me. Hurting me because, being in absolute denial, I would wear them in the rain, forgetting that they had holes in them and my feet would get soaked. Or wear them when out for an entire day, forgetting that the soles were nearly gone and every step I took felt like my bare feet pounding the pavement. I finally bought a new pair. Exactly the same (thank you Charles “Chuck” H. Taylor for your timelessness). Well, sort of. They were missing the paint and grit from many adventures and the holes that reminded me of the paths I took in life. Overall, my new sneakers lacked the character and history that took 15 years to create. But… they were still super cute, they fully supported me, I could wear them all day without my feet hurting, they were solid and could withstand the trials and tribulations yet to come. And as time happens, they have since accumulated their own character. I love the story of my sneakers because it reminds me to consider what works in my life and what I am holding onto that no longer does. It reminds me to consider times when I put too much effort into making something work that actually doesn’t and to re-evaluate the usefulness or healthfulness of keeping that thing, habit, relationship, etc. Sometimes we have to let go, not because we no longer have a connection to or a history with something, but because it no longer works for us. Maybe you have your own pair of sneakers? an article of clothing? a relationship? Is there something you are keeping around that no longer serves you well? What would it be like to accept that it is no longer good for you? What would you replace it with that would match what you are looking for in your present life? What is preventing you from letting go? This entry was posted on Monday, March 12th, 2012 at 12:00 pm	and tagged with chuck taylors, empowerment, inspiration, letting go, relationships and posted in empowerment, relationships. You can follow any responses to this entry through the RSS 2.0 feed. « don’t be such a good accountant! Love this. It bears repeating in more ways…. I like to start every class with a visualization ; we all walk into that room carrying things. Unnecessary baggage. Unresolved conversations. Unfinished business. We carry it on our shoulders and in the chatter in back of our heads. Take a deep breath in- and on your exhale, feel yourself drop the baggage. Hear it..hit the ground. See it….dissolve and disappear. Now feel your shoulders release. You are lighter. Unfettered. What might you do now that you are un-weighed-down ? The more often we take stock and clear our space and clear our heads- the more we can make of ourselves and our time….the more we can move towards our true potential. My partner, (the amazingly talented…) Kate Tempesta, has done so much to inspire me to release a lot of physical baggage. She encourages me to really evaluate the objects I hang onto, and to release them. In her words; “JUST get RID of it!” It sounded cold at first. But the truth is, you’ve got to move the old stuff out not only to make room for the new, but to allow yourself to EVOVLE. thanks for your inspiring words, christine! you are you can you will you do!!! I love everything about this entry, Jodi. There is such important symbolism here for everyone. I take so much away from it for myself and thank you for putting it all together. Your entire blog is awesome…this is one of the best! Thank you for inspiring me as you do. thank you for sharing your experience and i’m grateful to have your support!